Tobacco warned Portland, “I wouldn’t recommend being on any psychedelic drugs for some of the visuals” before he brought his grit-hop to Holocene on Monday night. Immediately logging onto Chatroulette and pointing the camera into the crowd, Tobacco (the mastermind behind Black Moth Super Rainbow) and friends kicked into a wildly crunchy, chunky, electro-hip-hop set. But most eyes were transfixed on the projections abrasively staining the wall behind the three-piece. Some internet fans rocked out, others queried “WFT? !” and spun again while the loudest cheers of the night were for Chatroulette masturbator #1… there were at least two more. Chatroulette was an added bonus, the real optic stimulation came from Tobacco’s prepared footage. Easing Portland into his twisted, sensory set, 8-bit visual psychedelia floated alongside 8-bit analog synths and samples as sailing Magic Eye sailboats coasted through willows and neon geometric patterns. A cult film aficionado, Tobacco took his name from Redneck Zombies and has a soft spot for ’80s awkwardness. His rhinestone encrusted beats chomped along with clips of early ’80s Fat Boys music videos, but entertaining hilarity quickly turned downright disturbing as head after head after head crashed through glass table tops. 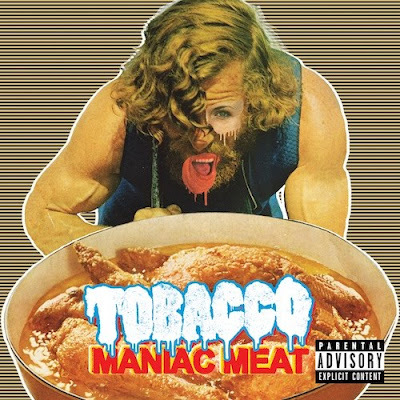 Read the rest on OMN plus hear a track from Tobacco's new album Maniac Meat.